On this day, the 16th Ohio started their march, now southward, toward Marksville, Louisiana, at 10:00 am. The regiment marched 12 miles across the prairie and camped near Fort DeRussy, a Confederate fort captured by Gen. Banks two months earlier on his march toward Shreveport. The Union troops continued to be fired at by the ever harassing Confederate troops of Gen. Richard Taylor. We kept on the road all day on the 15th getting along very slow. The weather was warm and the ground dry and dusty. Night came and the weary hours crept by as we moved along in the darkness. Shots in the rear and front that sounded wild and dismal now and then broke on the night air. Our cavalry in advance (came) upon a force of the enemy at Marksville, and an obstinate little set-to took place. A furious charge of our cavalry terminated the affair and secured to us two pieces of artillery and some prisoners. We did not bivouac until midnight, and then in no order whatever. The men just laid down anywhere, too much oppressed with sleep to hunt a good place to spread a blanket. It should be understood that the troop movements and routes shown on these maps is approximated. 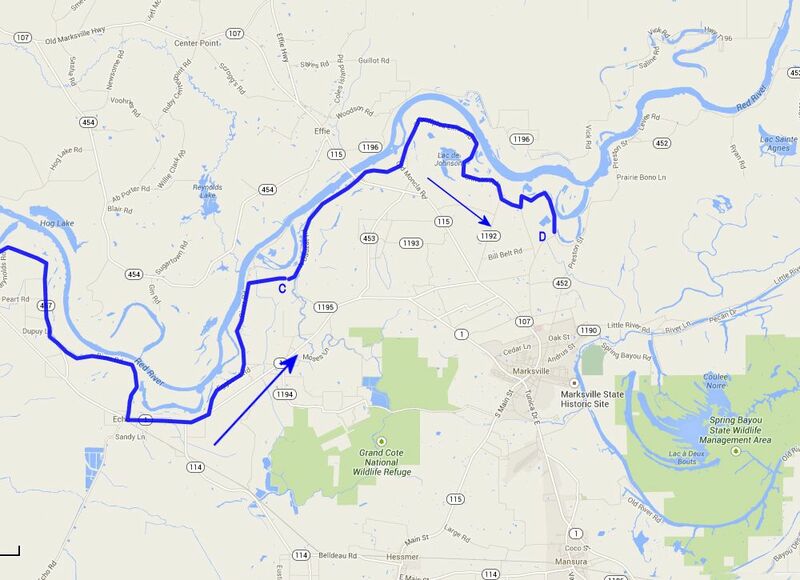 Pertaining to the route shown below, based on information from soldiers' diaries which mentions seeing the sunken boats in the river and camping near Fort DeRussy, it is assumed the troops, at least some of them, including the 16th Ohio, stayed along the river, possibly for the protection of and to be protected by the powerful fleet of Federal gunboats, also moving east. The gunboats were vulnerable to Rebel ambush and so it is surmised Banks kept troops along the river to protect them. It is most likely that, given the large size of Banks' force, bodies of Union troops took various routes through the area, ultimately heading for the safety of the Mississippi River. This period military map shows the approximate route taken by the 16th Ohio and other troops under Gen. Nathaniel Banks as they evacuated Alexandria, Louisiana, heading south and east along the Red River.The campsites of the 16th Ohio are highly approximated, although we do know the 16th Ohio camped near Ft. DeRussy on the night of May 15, 1864, as shown. 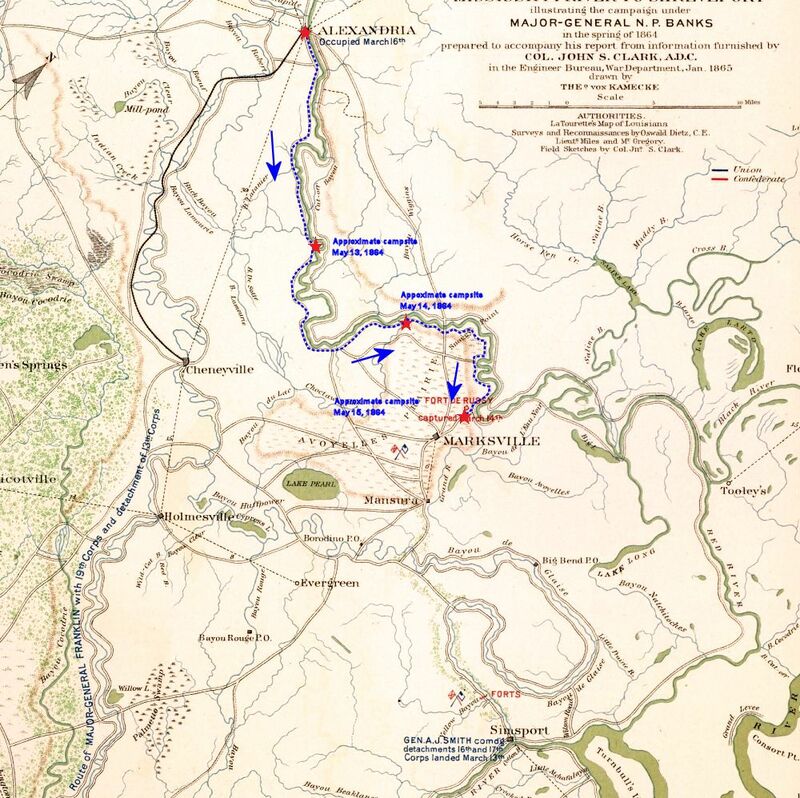 Note that original military attributions on the map reflect the earlier routes of Gen. Banks when he first marched up the Red River in an attempt to capture Shreveport, Louisiana. C - Highly estimated location of the 16th Ohio when it camped for the night of May 14, 1864. D - Approximate location of the 16th Ohio when it camped for the night of May 15, 1864, near Ft. DeRussy, Louisiana.